On 19th March 2019 Java12 was released. 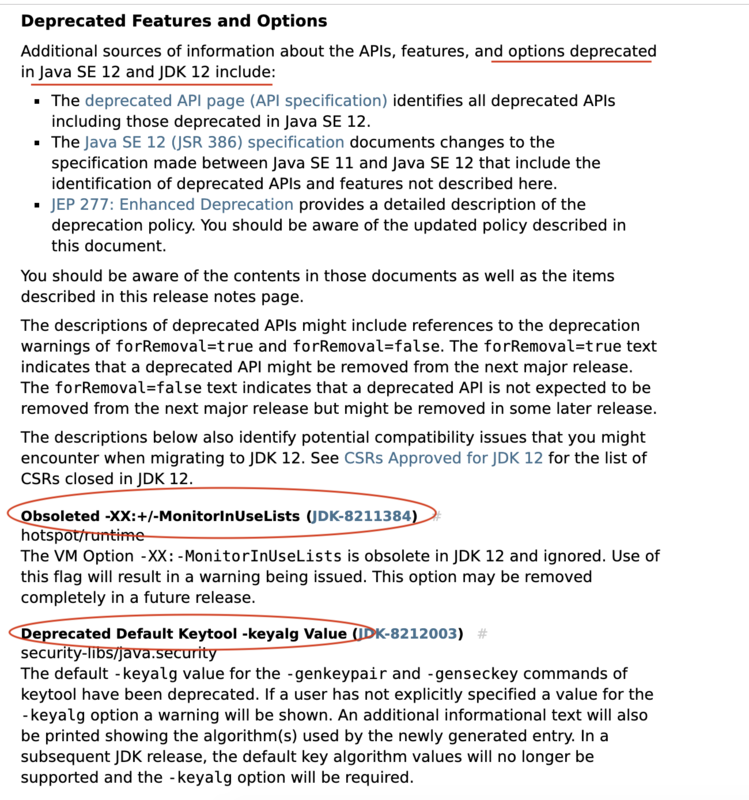 As we know Java12 was part of rapid release, it was released just in 6 months after Java11 release. In this tutorial, we will go over all changes and new features about Java12. Personally I switched to Java12 for all of my development but for production cycle it’s too early. Keep this tutorial bookmarked when you want to switch to Java12 for all of your production projects. There are quite a few internal and user workflow related features in Java12 which changed. Let’s take a look what is inside Java 12. Normal Garbage Collector usually unloads unused variable during GC cycle and we usually notice some halt/pause in process, or CPU increase during that time. Usually we don’t even notice that. With ZGC (Z Garbage Collector) – Java12 supports concurrent Class unloading too. As this happens during normal GC cycle, there isn’t any pause and no more memory extra usage too. When there is a OOM (Out Of Memory) error or JVM crashes, usually Java creates dump files with all details. With this JVM parameters, Dump files will be created under /tmp/crunchify/ folder on OOM error. New log file will be created named hs_err<pid>.log with all details about JVM crash. This is very helpful for your production environment if you are seeing frequent crash and want to debug more. By default it’s disabled but you can enable extensive crash report by adding above JVM command line parameter. java.text adds support for compact Number format. 100o can be mentioned as 1K and 100000 can be mentioned as 100K. // NumberFormat is the abstract base class for all number formats. // This class provides the interface for formatting and parsing numbers. NumberFormat also provides methods for determining which locales have number formats, and what their names are. // getCompactNumberInstance returns a compact number format for the specified locale and formatStyle. if disallow then System.setSecurityManager can’t be used to set security manager. a user can specify a named group when generating a key pair. Enhanced Switch statement is now supported in Java12. Java 12 based case L -> syntax operation. Here there isn’t any break necessary. if a label is matched, then only the expression to the right of an arrow label is executed. 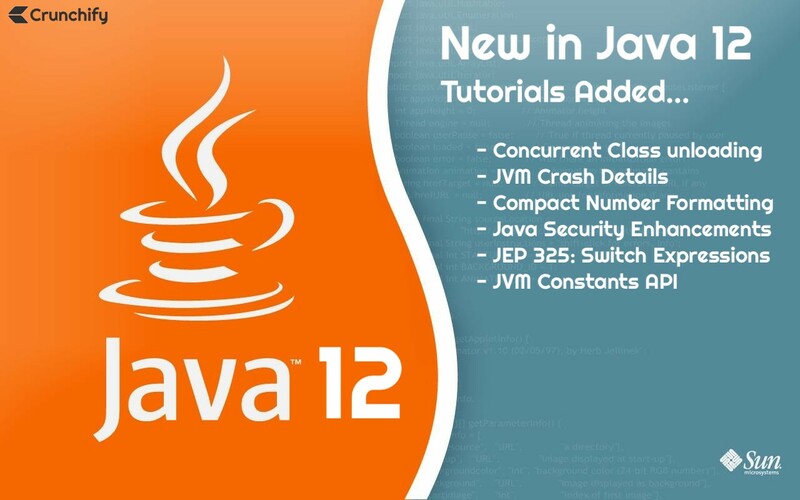 * What's new in Java12 Switch statement? * Java 12 based case L -> syntax operation. * Here there isn't any break necessary. java.lang.invoke.constant: As you may know, Java class has constant pool which stores all operands at runtime. Java12 adds API for invoking constants at runtime. Let me know if you have any handy tutorial on Java12 which you would like to include here.